You look like a sun goddess, dear. Super love the vivid yellow color and the colorful pouch. Marvelous! OMG – Shauna! You always outdo yourself! 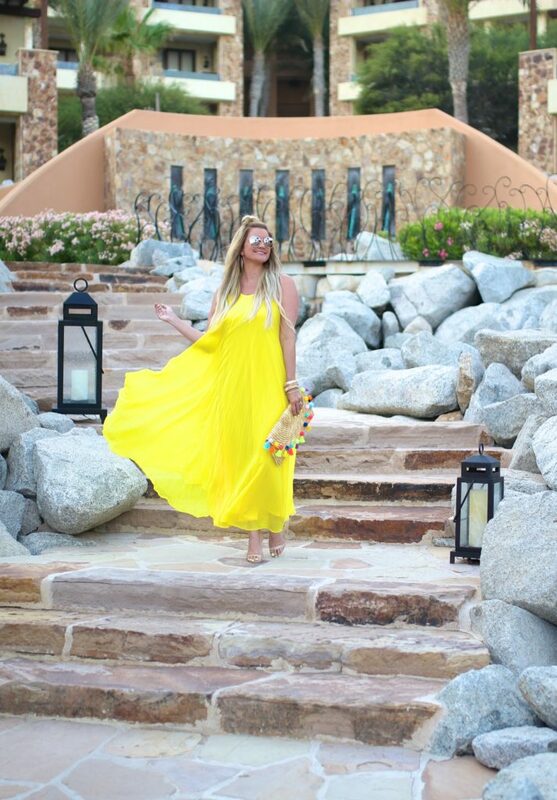 Love love this bright yellow maxi and the pop of color from your clutch. How dreamy!! What a lovely dress!! So chic!! YOU are true sunshine all the way!!! Golden Gorgeous and MORE!!! I adore this with the clutch and the color just makes me smile!!! I hope your week gets off to a great start! You look like a beautiful ray of sunshine from your head to your toes! This is such a perfect va-cay look! So glad you had an amazing trip! beautiful!!!!!!!! !I love yellow too-such a cheerful post & I want to go there too!! Wow! You do look like your floating down the steps! How GORGEOUS! What a beautiful dress!! I love this entire look, especially that cute little clutch. You are gorgeous! What a lovely outfit! And you look so beautiful in yellow! Such a fun dress and so perfect with your bag! Love it! Wow, this is a difficult color to pull off… and you wear is beautifully!! wow you look adorable in this maxi dress, love the yellow color, so pretty . Amazing look. I need to order this dress. Yellow is my fave in the summer. Yellow is a very good colour for your skin tone! Can I just say that I am in love with your whole outfit. Beautiful and bright for summer. Me encanta el look! El color es genial! Such a gorgeous maxi! Just love the cheerful color on you! This dress and color is just gorgeous on you, Shauna! I actually almost bought this dress for our trip to Palm Springs haha! I agree — nothing better than a bright yellow in the summer! So glad you guys enjoyed your trip! We will definitely have to check out the resort next time we go to Cabo! Happy Monday! You look amazing in this yellow! And top knot perfection.. amazing! Love that fun bag! Shining dress 😉 Perfect fit on you! You are the epitome of summer! What a bright, cheerful look! Love that clutch. This bright yellow looks stunning on you! The straw handbag is so on trend and I love the colorful tassels on it! Love the electric vibrancy of this look! The pompom clutch is the perfect accessory for the dress and really brings the outfit together. Beautiful! Shauna, can we just talk about how gorgeous this maxi dress is? Love that bright yellow! How stunning you look in this bright yellow dress! Even on a dull day it brings sunshine to life! You are the cutest in this yellow and bright dress! Makes me so happy and that matching clutch is super perfect! I love wearing yellow in the summer too! This yellow dress is stunning and I love how vibrant and flowy this dress is! omg, this yellow dress is stunning on you and LOVE that clutch!! You are little miss sunshine!! Gorgeous maxi, love the color and it looks beautiful on you! That is a great dress to wear on vacation! I love the beautiful color of it because it is so bright and cheery! You look SO good in yellow, babe! Great vacay dress! Ok, you look gorgeous in your yellow maxi dress. Like a geek goddess! I can see why it was your go to dress for Mexico. That colorful clutch is the perfect accessory!! So glad you’ve had an amazing trip! Shauna! I’m pretty sure you look gorgeous in every color!!! Yellow is no exception and you look fantastic! I love this dress and that pom pom clutch! That is my favorite shade of yellow! It’s the happiest color ever! Love how it looks on you! 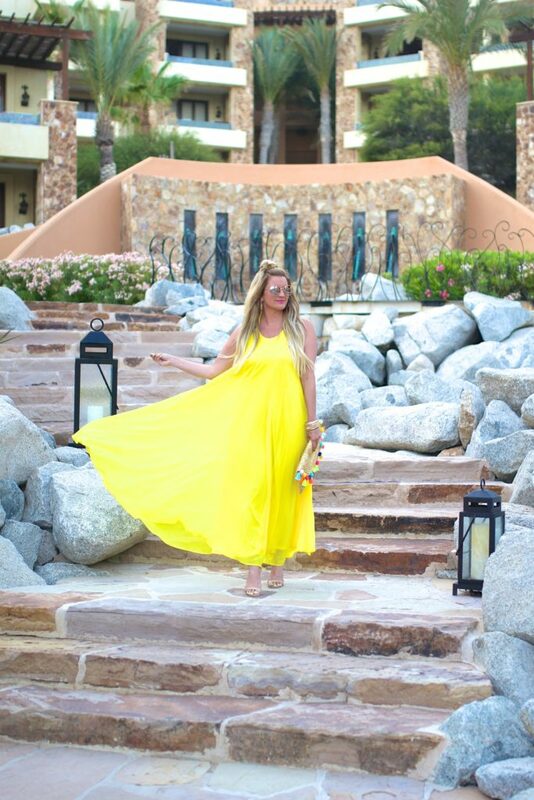 I just LOVE this flowy yellow dress, so perfect for vacay!! The resort sounds so amazing! You are the queen of colorful dresses and this one is just GORGEOUS! Love this shade of yellow!! Little Miss Gorgeous!! These photos are so dreamy. I also want to steal that clutch! So cute! This dress is definitely shining as bright as the sun! This is seriously one of the most amazing shoots you’ve done. That staircase and dress with the clutch is just gorgeous lady!